Print your message and the date! The self-inking Trodat Printy 4729 can be personalised with your message - up to three lines of text above and below the date - on an imprint size of 50 x 30 mm. The date has a height of 3 mm and the format: day, month (in letters) and year. 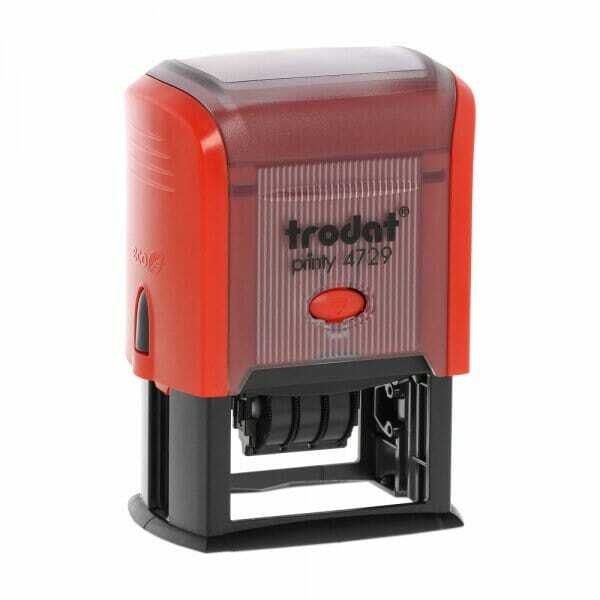 Being part of Trodat's bestsellers, the stamp is climate-neutral: with maximum possible content of recycled plastic. To further extend the life of your stamp, order the suitable replacement ink pad 6/4929 - available in black, blue, red, green, violet - or 6/4929/2 two-coloured blue/red. Dry felt pads are suitable for special inks. Customer evaluation for "Trodat Printy Dater 4729 50 x 30 mm - 3+3 lines"